We hit the road bright and early this morning – breakfast was called for the four hotels where we have been lodging for the past 24 hours at 6:00am, buses were due to collect us at 6:30am, for a crack of dawn start after our day off from the town-centre car park where all cars have been under guard. Veterans spit and spat and barked in protest, chains were soon flailing round, Vintageants had starting-handles to stir cold oil, the classics having a later departure time had an easier time of it but we were all soon inching way out across town for the haul to Perm. So, how are we doing, now that the event has passed the half-way make in terms of both days, and distance, since leaving Peking? 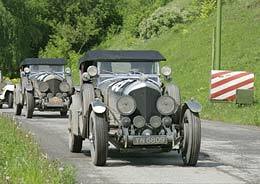 In the Veteran’s division, known as The Pioneer Category, there are four Gold Medal performances which have been set by the two leaders, both Rolls Royce Silver Ghosts…. Fred Brown and Tom Stevenson is first overall, and Neville Jordan and Bruce McIlroy second, both up for Gold Medals… the 1915 Itala of Theodore Voukidis and Fabio Longo and the La France of Ralf Weiss and Kurt Schneiders are also on Gold, fourth and fifth overall. Tim Scott’s 1903 nine-litre Merc, the oldest car in the event, has driven every mile, along with Daniel Ward and David Ingleby in the Talbot…Silver Medals are the ambition of David and Karen Ayre, in the Itala, Michael Power and Anthony Malcolm-Green in the Prince Henry Vauxhall, and the Paul Bessade’s team in the Brasier Torpedo. Andrew Fulton and Warner Burntjen in the Essex is running again and one of those due for a Bronze Medal if they can now keep going. A truly remarkable effort by this bunch. The 1907 Itala of David and Karen Ayre is here, parked up next to the Talbot of Daniel Ward and the Rawling’s Chrysler. Some have been a model of reliability. They have coped with no windscreens, bench seats, next to no suspension, no front brakes, skinny cross-ply tyres, and pounded over appalling surfaces equally as bad as anything found on an East African Safari. Every day they have checked out to qualify for either a Gold or Silver Medal, driving a route that defeated two celebrities on off-road modern BMW motor-bikes who tried the same route for “The Long Way Round” but felt forced to give up and leave Mongolia for a softer-option route across the top of the country in Russia. This fact alone makes their effort truly fantastic. Those crews who prepared for the absolute worse, followed the notes in our book “How To Prepare a Successful Rallycar”, and came with a car that was blessed with good suspension travel and good ground-clearance, have done better than many others. Quite a few cars looked like they could be contenders for a concours-de-elegance, but had no rally preparation at all. Quite a few set out from Peking with no waterproofing, no dust-proofing, no caps to the engine mounts, no expansion bottle or header-tank for the radiator, no reinforcement for the battery tray. Indeed, some came with batteries many years old. Quite a few had no skids or protection over vulnerable areas underneath – the tiny Rover 12 has absolutely nothing underneath to protect it from the rigours of desert travel, not even in a tank-shield and sump shield as bash-protection. Driven with the utmost care, it’s had far fewer problems than many. Those who are eternal optimists, but admit they can’t change a light-bulb, and refused to pass on to their workshops any of the Rally Office bulletins, have in the main been riding some or most of the route on the back of a truck. Copper fuel pipes, unprotected and having to run the length of an engine bay, hanging over a hot engine, soon had tiny splits as a result of the vibration – all advice having been ignored. Those who fitted plenty of large fuel-filters, the size of jam-jars, and ran protected fuel lines inside the car, had fewer problems. Some engines were never built for running on 80 octane fuel. Others fitted shock absorbers that were twice as hard, doubly strong, but without substantially reinforced mountings suffered the problem of many who experienced broken mountings, losing time in having these welded up. Drivers who came on this event reckoning “we are not out to drive fast, so have not had to prepare it like a rallycar” found themselves caught out and became victims of the conditions. One car dumped a radiator full of vital water onto the ground of a desert when the radiator boiled, after the fan split the core open due to broken engine-mounts. “The car ran perfectly in Ireland,” was a comment from the driver... Quite a few drivers can’t say when anyone last looked inside their back axle or when seals and bearings were replaced, but hoped it would get them half-way round the world on an event that was billed as an accurate recreation of what the pioneers faced 100 years ago. So, given all this, the fact that we have more than 100 cars running, and so many up for medals, it quite astonishing. Tyres have been a regular discussion point. Blockleys have given the Vintageants plenty of punctures, others on Michelins or Dunlops with heavier plies less so, and some regard punctures the least of their problems. In the Classic Category, some cars have run tough Colway Emjo remoulds, and experienced no problems or punctures at all. Others who fitted heavy truck-like tyres wonder if the increase in unsprung-weight has added to their shock absorber problems. Determination is a very personal thing. And determination has had a big bearing in deciding who wins a Gold or Silver medal. There are those who will seek out a blacksmiths workshop and have a radiator brazed up and drive through the night to catch up….others with ailments that were hardly of the car-breaking category gave up just as soon as it got tough. Some cars that should never have crossed into Mongolia insisted on doing so, hoping in a spirit of great optimising all would hold together, only to face the bureaucratic hassles a day or so later of how to get out of the country. Willpower, determination in the face of adversity, an ability keep going when the car presents despair, the results leader-board sums it up. 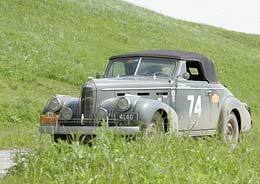 The crew of car 75, the Dutch crew of Olaf Pothoven and Robertus Van Den Berg in a ’39 Maigret Citroen, drove 1,650 kms to catch up the rally – in 21 hours. The driver lost time having to go to clinic for injections after being bitten by a dog, and the car suspension added to the crew’s woes. 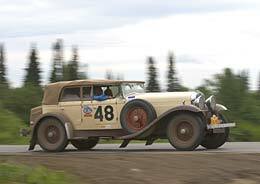 One of the oldest drivers is Bob Pattison in a 1928 Chrysler – a late entrant, perhaps it was not prepared as well as the best. Once in Mongolia, he suffered engine problems with a bent con-rod, and then broke a half-shaft in the axle. He is here tonight, walking round the hotel, and looks a happy man. In the Vintageant’s Category there are 22 crews up for a Gold Medal, and 18 on Silver. The Category is still headed by the three Chevy Fangio Coupes, but its interesting to note that Paul Carter and Vincent Fairclough are just over a minute behind in fourth place, and the Alvis of Horst Friedrichs is in fifth – the Thompson’s in seventh-overall are on their first-ever rally in their Chrysler 75. The Classic Category is headed by the Mercedes Fintail of Pit Lindner who must now be feeling a touch fed up with being asked “are you really a taxi” by Russian TV crews, with around half an hour in hand over the Jaguar Mk2 of Richard Worts and Nichola Shackleton, nearly four minutes ahead of the VW Beetle of Garry Staples. The striking looking orange Studebaker of Tom Hays and Andy Vann is fourth, and the Goodwin’s Aston Martin fifth, with the Riley RM of the Wilkinsons sixth. The Ladies Prize looks like going to Pamela Reid and Nicola Wainwright in the Sunbeam Rapier, holding 7th and on for Silver Medals if they can keep going. Francis Carey in the open Fifties Bentley lost his co-driver due to disagreements, but is still in the running, luckily for him he was able to take on another in the shape of Scott Anderson, who was piloting the troublesome Model T Ford which failed to get out to Ulaan Bataar, but flew in, and found himself a role – the penalty for an unscheduled crew-switch of 24 hours has been applied. The Porsche 356 of the two youngest crew members in the event, Gerry Harrison and Andrew Douglas, elected to stay behind this morning, awaiting parts for a rebuild of their engine after breaking a piston ring – the old troubles of swallowing too much dust that used to afflict Porsches on the original Marathons of the Sixties is thought to be the root cause, and rather than limp on they have decided discretion is the better part of valour. A pity, not starting out today means they lose their Silver Medals. However, despite the severe bashing yesterday, this morning’s line up included the pith-helmet of the lone driver Jan Vorboril in his home-made Veteren Special, the bent front axle and buckled wheels from the accident the other day was all hammered straight on the day off. Walking to his car in a long-flowing sheepskin ankle-length coat, donning his hat, he got a little clap from a bunch of drivers who have had it far easier, so far. A total of 110 cars clocked in to Perm tonight, out of a total of 128 that left Peking. Nobody expected that statistic at the half-way point.